Is there another piece of important equipment on a car more overlooked than the brakes? Despite the need for quality brakes, many drivers choose to ignore the symptoms of degrading brakes altogether, which can result in unfortunate, and sometimes unnecessary accidents. 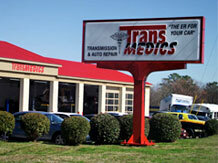 If your car needs new brakes, visit TransMedics — Raleigh, NC’s premier source for new brakes and brake services. Our service technicians are brake masters, able to provide the best in new brakes, rotors, fluid and more to car owners in the Triangle and beyond. Do you have to push down harder to brake effectively? If the answer is, “Yes,” then you’re already noticing one of the clearest signals that new brakes are needed. A slower response time can mean the difference between an accident or avoiding a collision altogether. Do your brakes make the familiar high-pitched squealing? Although it’s incredibly annoying, the squeal is being made for your benefit. A tiny metal piece known as an indicator is there to let you know your brakes are nearing the end of their working life. Does your car pull to one side of the road, even on flat surfaces? If your answer is, “Yes,” new brakes could be necessary. The car pulling to one side while braking could also stem from dirty brake fluid or worn linings — either way, you need to visit our Raleigh, NC mechanics. Does your brake pedal vibrate? Yes? It might be that you need to stop by our auto shop in Raleigh, NC for an alignment and a tire rotation. It could also mean that the brake rotors are worn. Call on our auto shop today to learn more about our brake services, or simply bring your car by for a free diagnostic. TransMedics is a proud provider of new brakes to drivers throughout Raleigh, Wake Forest, Rolesville, Knightdale, Durham, Cary and all surrounding areas.